What is a good way to get somebody to look at your business card more than once? If you're a real estate agent, you probably already have a good idea - stick a yearly calendar on your card. People love calendars reference calendars, and the more convenient they are the better. Of course, people are also in love with their phones, so they may not need to carry a calendar in their wallet. But, there's still the fridge. If you get as much mail from local real estate agents as I do, you probably have plenty of calendar magnets for your fridge by now. I'm sure there are other businesses that could benefit from printing calendars on the back of their business card. If that sounds like a good idea to you, or if you just want to create a little business card magnet for your own use, you can download the new Business Card Calendar template found on my Business Cards page. Microsoft Excel is a great tool for creating calendars, but not very good at printing to specific dimensions. Microsoft Word is great for printing business cards, so we've come up with a simple and easy hybrid solution. On the business card template page, you'll find a link to download the Excel template (see screenshot on the right). In the Excel template, enter the year and the starting month. If you want the calendar to start on a Monday, you can do that, too. The template also lets you check a box to make the calendars stack top to bottom. If you want to use a few preset shading options, you can choose those options from the drop-down box, or choose "No Shading" and format the calendar however you see fit. 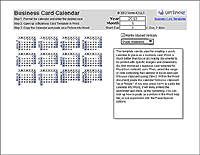 To get the calendar into the business card template for Word, just select the cells containing the calendar from Excel and press Ctrl+c to copy to your clipboard. 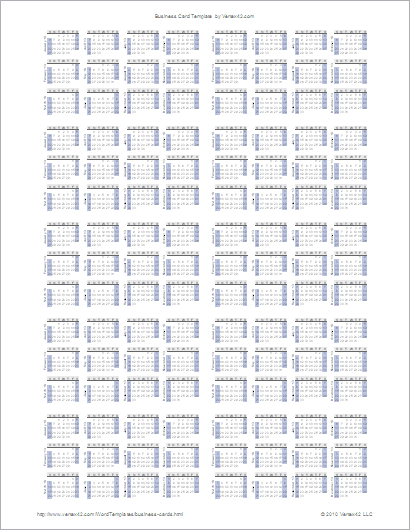 When you paste the copied calendar from your clipboard into Word, paste it as a Picture. If you're using Word 2003, you can go to Edit > Paste Special > Picture (Enhanced Metafile). If you're using Word 2010 or later, you can choose "Picture" from the paste options after you've pasted the calendar using Ctrl+v. 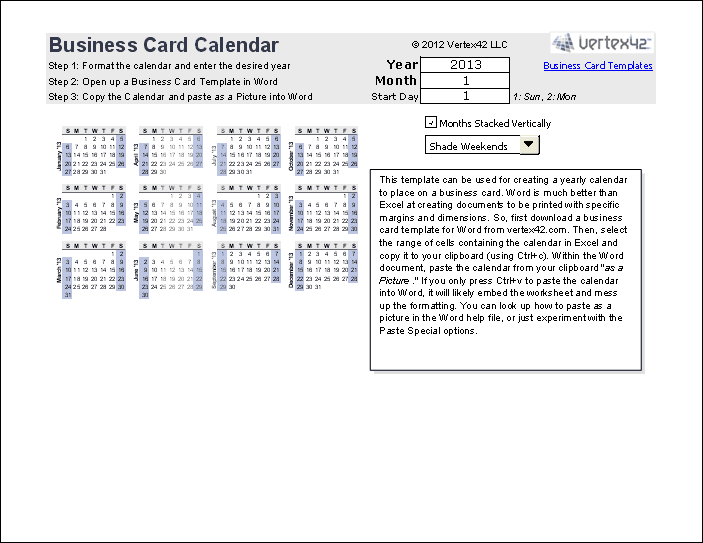 After you have the calendar inside one business card, you can select it and copy/paste into the other business cards. A big thanks to Nathan Smith for his initial suggestion and ideas for the business card calendar. 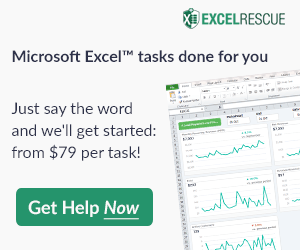 thanks a ton for helping us out with excel tools and calendars. particularly i am amazed by the diversity of your calendar designs! thanks again and keep the show going. As usual a very nice setup and useful tool! Hi, thanks for this. I’m just starting a shift rota for the year and was looking for some way to put it on a credit card size print, so I could carry it about. Your process and templates have let me do that by simply adding shading to the cells corresponding to the days I am working, which is great. One issue I have is that when I copy the Excel data as a picture the text of the month names does not show properly but is pixelated and unreadable. I am using Word and Excel 2007. @John, I don’t have a ready answer for you. Keep trying different things, Googling, or whatever and you’ll likely find a solution. When I want to capture an image, I often use a screen capture rather than the “Copy as a Picture” technique within Excel. Thanks so so so so much. it was really helpful. To be frank i didn’t know Excel can even do such a thing. thumbs up. Great !! !Thanks for sharing ! Next Post: Gantt Chart FAQ – Have a Question Prior to Ordering?